Here's one of the Christmas cards in the stack that I made. 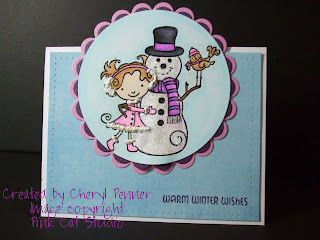 It is made with stamps from Pink Cat studio. I'm positive I cased it from somewhere, but I have no idea where. If you know...let me know! Anyway, I love that it's non-traditional christmas colors! I used perfect puff for her earmuffs and for the trim on her outfit. Have a great day! The sun is shining here, so I'm off to go enjoy it while it lasts! Cheryl this is so cute!! !